One of the case studies in CADWAGO explores how European policies on renewable energy, food and agriculture affect water resource management outside the European Union (project website). European citizens’ consumption of vegetable oils is on the rise, triggered partly by the EU’s Renewable Energy Directive but even more so by the use of manufactured food products and cosmetics. Imports of palm oil to Europe just about doubled between 2002 and 2008 and continue to rise. The European Commission and Parliament have tried to ensure that EU policy plays constructively into global sustainable development. One example of such ‘safeguard’ measures is represented by the Sustainability Criteria in the Renewable Energy Directive. However, they do not address impacts on water resources – in fact a wide range of elements normally encompassed by the notion of ‘sustainability’ are omitted (read more). In June this year, I visited Palawan Island in the Philippines to work with the Palawan State University and consult people on what impacts they experience from the expansion of oil palm cultivation in the island. The first corporate oil palm project, led by a Malaysian company, was established in late 2000s and today more than 15 000 ha are harvested. This corresponds to close to 3% of the agricultural land area of the island. New investments are on the horizon. The oil palm project has been welcomed by the Provincial Government and several municipal governments as a source of income and livelihood diversification. Many farmers have benefited from the project – especially well-resourced lowland migrant settlers with start-up capital, higher education, and/or employment in government institutions. Meanwhile, a large number of complaints have been filed from less privileged groups. Smallholder farmer cooperatives have been caught in strangling out-grower contracts, which place the decision making authority with the company. Members of several cooperatives have become tenants on their own land. Tribal groups allege extensive land and water grabbing in breach of national law and international human rights norms. 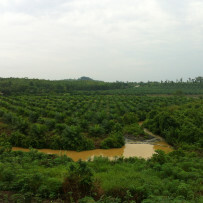 Environmental groups document illegal logging and risks of water pollution and soil degradation arising from the monoculture projects. Back in Stockholm, working to complete the field report, I am struck by the great gap between the assumptions of European policy and the local reality of people charged to manage water resources in countries that deliver the vegetable oils that we increasingly demand. Hopefully, our work in CADWAGO will make a small but worthwhile contribution to support stakeholders in the Philippines and the EU to recognize their interdependencies – as dwellers in the same global watershed.